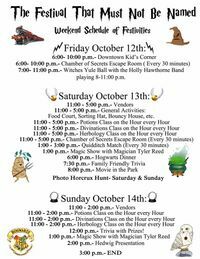 All are welcome to slither into the Wizarding World of Strasburg, Virginia for a Harry Potter inspired Weekend! Wizards, witches, and muggles alike can enjoy the family friendly activities through the weekend that include a House Horcrux Hunt, Temporary tattoos, Chamber of Mystery Escape Room, Meeting Hedwig the Owl, the Sorting Hat, 9 ¾ Train Stop, and classes in Potions, Herbology, and Divinations – and so much more! We hope you can join us for the 2nd Annual Event! We kick off the weekend event with a Witches Ball at the Box office Brewery sponsored by the Town of Strasburg, Saturday the streets are filled with vendors and we end on Sunday with the live owl presentation, magician, and Harry Potter trivia!